2008 Chevrolet Silverado LTZ 6.0L Vortec Max For Sale in Alliance, Nebraska 69301 Bigger is always better...and this 2008 Chevy Silverado is no exception. This pickup truck's rugged good looks are sure to capture the attention of anyone who sees it, with Desert Brown Metallic paint complemented by an exceptionally clean leather interior. However, this Chevy is much more than meets the eye. Powered by a 6.0L Vortec Max engine that is mated with custom built automatic transmission and durable four wheel drive, this handsome devil is eager to tackle anything life throws at it. With only 38,000 miles you can rest assured that this bad-to-the-bone pickup will be on the road for many years to come! This Silverado LTZ has been outfitted with some impressive features that offer the ideal combination of performance and appeal. It comes with a MagnaCharger Supercharger TVS 1900. You can check out the entire kit at horsepowerfreaks.com for more information on everything that comes with it. Other highlights include Corsa Sport Exhaust, 20-inch factory chrome Chevy wheels, and Firestone Rear Trailering Air Bags with gauge located on the right side of the red switch. It has ATS custom built transmission with stall converter and in addition to all of the work completed it has been professionally tuned. For your entertainment needs it comes with an aftermarket Kenwood touchscreen complete with navigation, as well as an Entertainment Flip Down DVD player. With a 10-inch JL Audio subwoofer, this impressive truck will provide you with the ultimate truck driving adventure that is laced with world-class comfort and convenience. 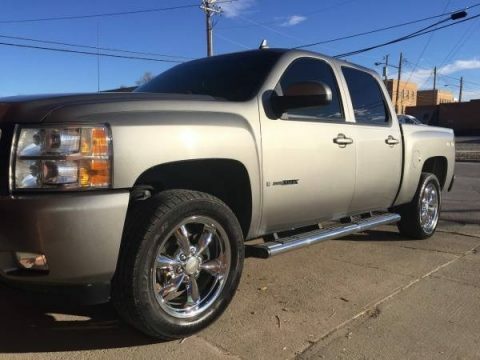 This 2008 Chevrolet Silverado LTZ with 6.0-Liter Vortec Max engine has been meticulously maintained. The carpet and leather is in impeccable condition with no stains or rips, and it barely has every day wear. This truck is a must see/drive to truly appreciate everything it has to offer. In fact, come see for yourself! You will agree that you cannot find another fully-loaded Chevy Silverado LTZ in this condition for the asking price. Don't miss out on this like new truck you've been searching for at a very affordable price. Call today for more information on how you can experience everything life has to offer with this Chevy Silverado LTZ!! !